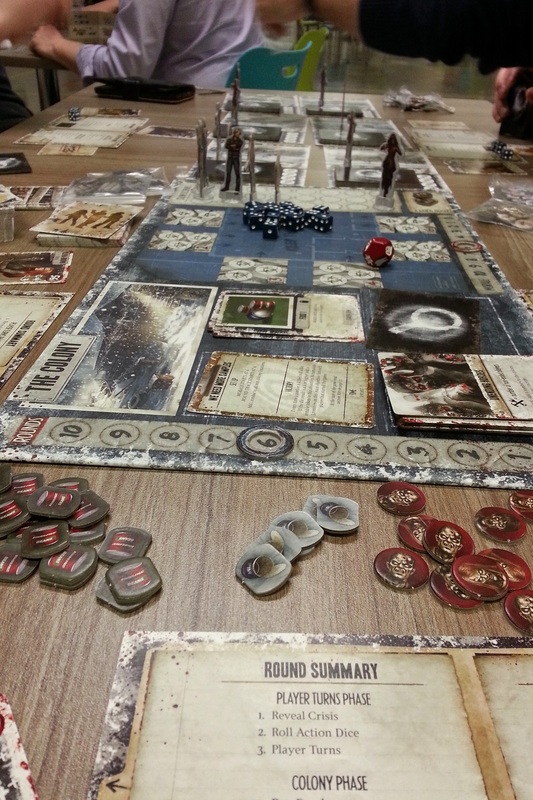 2014 is behind us and it was a great year of gaming, with many new faces coming to boardgaming or re-discovering a hobby they had left behind. Lots of amazing games were published, along with a bunch of not-so-great one. There seemed to be a lot more Kickstarter campaigns as well, both good and bad with others that we are still waiting for. So I may be a little late with my gaming year in review, but you know what? Better late than never. So, without more delays, let’s look at how 2014 went. First up, the year in numbers. I played 110 different games last year, and played a total of 312 times. So, lots and lots of different games, with an average of a game being played 3 times (which tells you that I don’t really play the same games too many times). The average of 3 is slight skewed by 2 or 3 games that I played a whole lot. My two most played games? 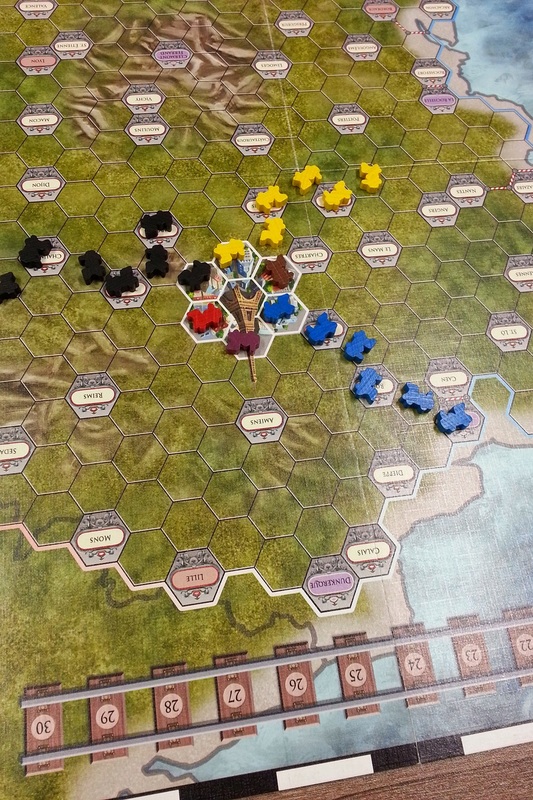 Russian Railroads (played 31 times), which should not come as a surprise, and Star Realms (played 43 times), which I grew to disliked but still played because it is so fast and painless online. Although I slowed down a lot towards the end of the year (and I’m still trying to get going all over again, work permitting), I still managed to put out 48 articles, with 17 reviews, 1 “How to play” and a few time-lapse videos. I really wanted to write more last year, with some noble intentions but alas, life and work caught up to me. Nevertheless, 17 reviews is pretty good, no? The game group at Ubi Montreal is still going strong, with the amount of players ebbing and flowing. We have a good core group of about 8 people who show up most week, but we really need to start recruiting more players again. It’s always odd to play boardgames in a video game company, thinking that people think you nerdy (which is, to say the least, ironic). These are my favorite games that I’ve discovered last year. Some of them are new games, while a few of them have been out for a few years, but I hadn’t had a chance to try them out yet. 7 of them are 2014 releases while the other 4 are older. My top game? Let me cheat and choose 2 instead: Kanban, Automotive Revolution and Sail to India. Both interestingly deep games, with quite a different weight/learning curve. 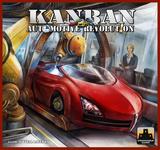 Kanban: Automotive Revolution (Stronghold Games) by Vital Lacerda: Wow. What a game. Looks really complex at first and could be seen as slightly visually confusing, but once you get going and things click, it’s such a great game. 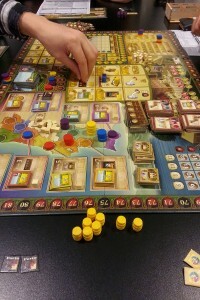 While it is at its heart a worker placement game, albeit with only one worker, it is really a game about timing. The board which seemed overly complex at first gradually makes sense, the rules which seemed too numerous suddenly become crystal clear since they do what you’d expect them to do. In a game about making cars, the engine behind this one is purring. Definitely (one of) the best (two) game(s) of the year! 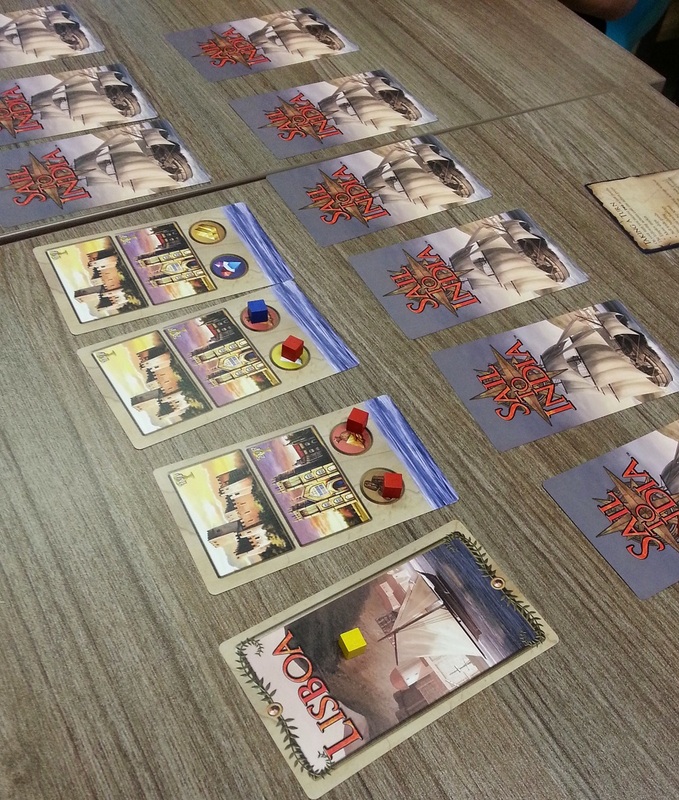 Sail to India (Alderac Entertainment Group) by Hisashi Hayashi: An incredible feat of maximizing components, this game is great and not simply because it is so small. Each turn the players are confronted by some hard decisions. Simple to explain and to understand, the real challenge is the correct use of each and every cube. My second game of the year, it is simply fantastic. Want more details? Check out my review! 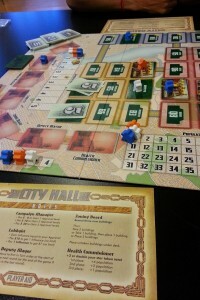 Thunder Alley (GMT Games) by Jeff Horger and Carla Horger: This one was nearly my game of the year. The only racing game that I’ll play anytime someone asks to play. I’m really not a racing fan but this game seems to do everything right. It plays fast, scales well and has such a strong narrative that you can’t help but have fun. This game has generated some of my favorite gaming memories in a long time, and they don’t even involve me coming back from behind to win the game! Such a great game that not only did I write a glowing review, but I also did my only “Sit Down and Let Me Teach You How to Play” video. Yeah, yeah… I’ll make more, I swear! 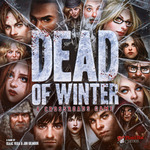 Dead of Winter: A Crossroads Game (Plaid Hat Games) by Jonathan Gilmour and Isaac Vega: Let’s face it: zombies are way over-played in boardgames, with only Cthulhu suffering more in the “tired game cliche” category. I have to admit to having a few zombie-related games, but I sort of gave them up a few years ago. Until Dead of Winter, that is. This is such a great game that you’ll forget that there are zombies in there. No, the real focus of the game is the interaction between the players and the zombies are just a minor annoyance. While everyone is trying to survive together, one (or more) of the players might be actively attempting to sabotage the entire group. A great game with a great narrative (thanks to the Crossroad cards), this is an amazing game. 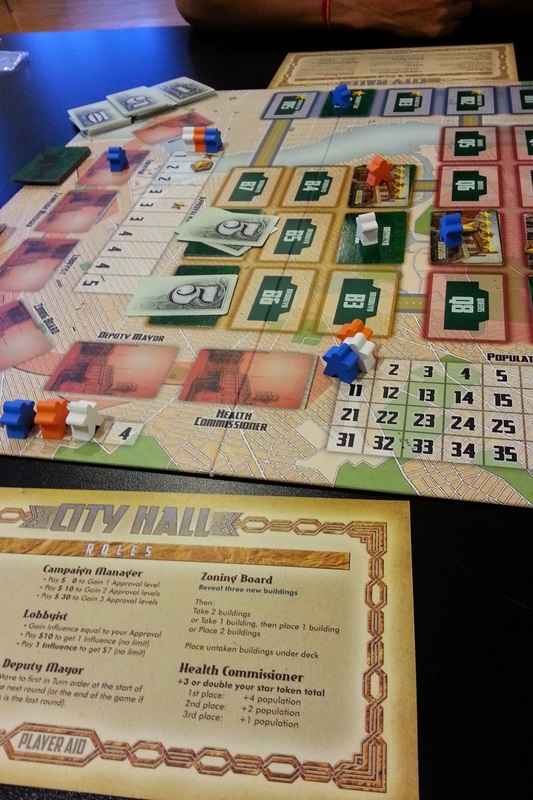 City Hall (Tasty Minstrel Games) by Michael R. Keller: This game is for me one of the great overlooked games of the year. I love what Michael Keller did with some familiar mechanics, changing them just enough that the game seems fresh. The dual currency is key here, with Influence being useful, except when Money is more important. There are always ways to mitigate the little luck present and reading your opponents is key when bidding for an action. I really should be doing a review of this gem very soon. Great stuff. Impulse (Asmadi Games) by Carl Chudyk: Another gem from the master of the multi-use card, Impulse is probably Chudyk‘s most accessible game. The most complex idea in the game is that of the “impulse”, the row of cards that everyone contributes to. By placing a card there, you get to do it, but so do the next three players. The cards themselves tend to be simple, but their exact value depends on where exactly they are. I love the way the map is built as you play: you can always flip and keep the card that make up the board, or if you don’t like it, swap it for a card in your hand. Sure, the choices at first seem overwhelming but you’ll find yourself quickly focusing in a direction, reducing the choices to just a handful. Great game and one that needs to hit the table more often. Panamax (Stronghold Games) by Gil d’Orey, Nuno Bizarro Sentieiro and Paulo Soledade: Another game that could easily have been my game of the year. 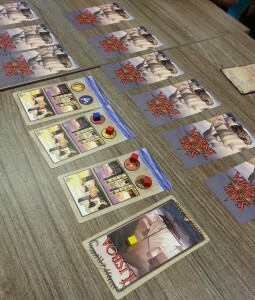 This, like Kanban, exemplifies the idea that the worse or boring the theme, the greater the game. After all, how exciting is moving ships in and through the Panama canal? Not very, right? So the game has to be interesting. And it is! 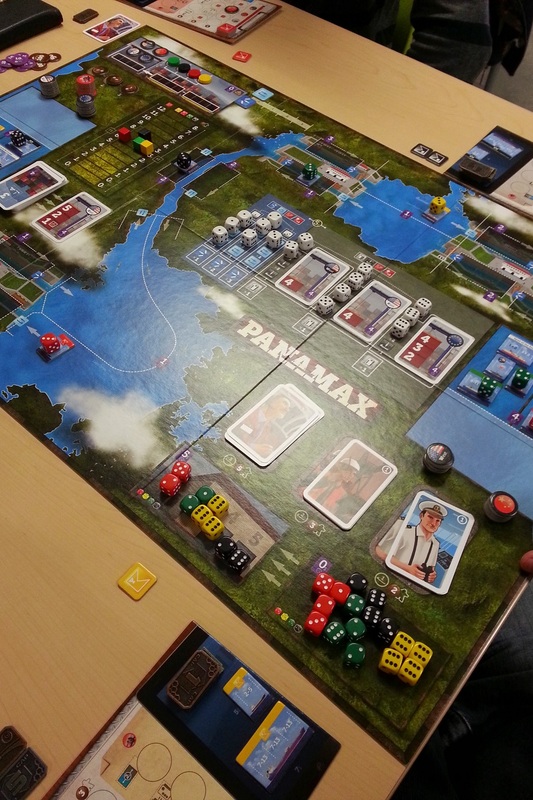 Using dice in not one but two very interesting ways, the players must sometimes work together to get ships with their goods from one side of the canal to the next. Again, this is a game that looks more complex than it really is maybe because of the rulebook. There’s a wonderful player aid over on BGG which boils down the rules to just 2 pages and show just how elegant the game really is. Another game which should live on my gaming table this year. Eminent Domain (Tasty Minstrel Games) by Seth Jaffee: I like the idea of deck builders more than I actually like most deck builders. I still have trouble figuring out when to switch from building to scoring points and I tend to find that most of them don’t really bring anything new to the table. 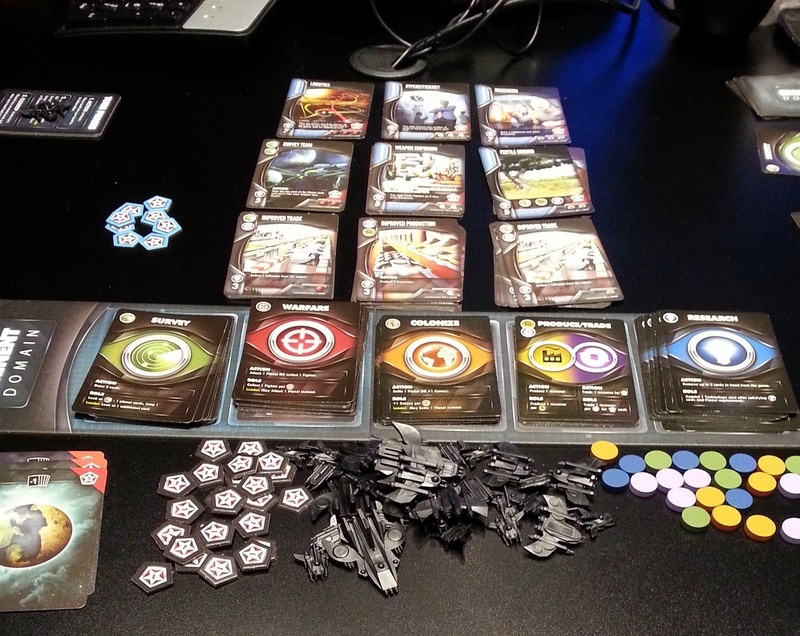 But then there’s Eminent Domain, which changes things up by borrowing a few mechanics from other games. I love how it dispenses with purchasing cards but rather uses the clever mechanic of taking a card that is the action you want to do and add to it with similar cards from your hand. Also, the idea of breaking down a player’s turn into both and Action and a Role portion, with the first part being done by the current player only and the Role part that can also be done by the other players. It makes for some interesting strategies as to when you do a given action. While some complain that the game is over too quickly, I kind of like that part. 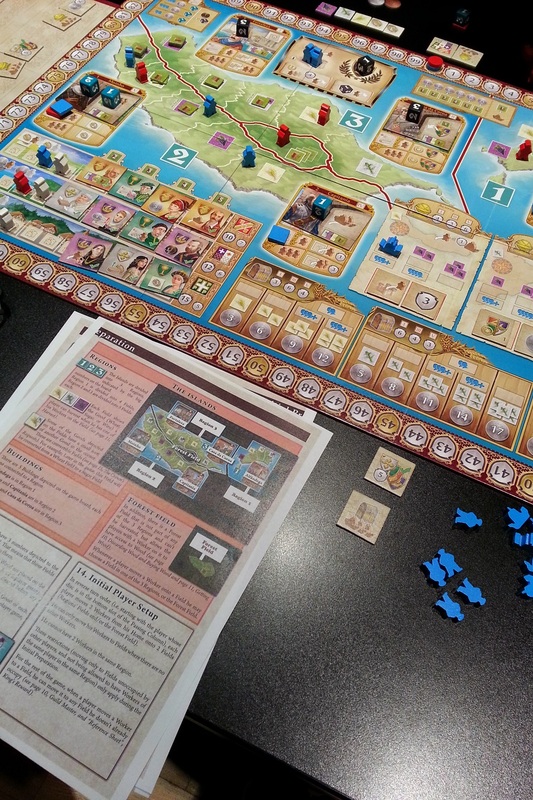 Now if I could only get Escalation to the table as well… This is one that I need to review soon. 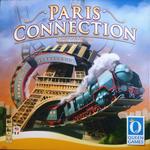 Paris Connection (Queen Games) by David V. H. Peters: Poor Paris Connection, the red-headed step-child of train games. Some people don’t see the game in there, but there is such a gem hidden in such simple rules. So, all you can do is either place up to 5 trains of the same color or swap 1 from behind your screen for 1 or 2? Where’s the game in that? Well, first thing, you need to time your actions well, such as which action you take and what color you move up the track. And then there’s the bluffing and pushing people to do what you want them to do. Since you can either extend the tracks or take extra trains (shares, really), you’re never really able to do everything by yourself and that’s where the game really start. It ends up feeling a bit like poker and it can be taught and played very quickly. Great game that should be played more. 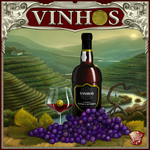 Vinhos (Z-Man Games) by Vital Lacerda: Well, last year I didn’t even know who Vital Lacerda was and now he’s one of my favorite designers. Not only did I get to play the excellent Kanban, but also I found out about Vinhos from the great Heavy Cardboard podcast. Thanks guys! This is a game nominally about making wine in Portugal, but in reality is it a clever twist on the worker placement (again, only one worker!) with a fun matrix where you can always do the same action as someone else, but you’ll pay extra for that privilege. A tight game with a very limited amount of actions, this is quite the brain burner. Of course, the more you play the more you see how every simple action flows nicely into the others. Simply amazing. 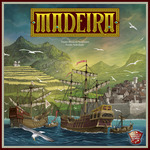 Madeira (What’s Your Game) by Nuno Bizarro Sentieiro and Paulo Soledade: I’m really not sure what’s going on in Portugal lately, but holy cow are some of the games coming out from there amazing. This is another heavy, heavy euro that came out a few years ago that I just found out about and boy am I happy. While it may be difficult to explain, it is more than worth it. I love the idea that while dice are used, they do not make the game a random mess of events, but rather set up what actions can be taken. The way the different parts of the board work, with the evolution of some of the parts you can exploit is simply genius. I love the increasing amount of goals you are given and the tightness of actions (never enough!) given. Very cool and very heavy. Before I start, let me give you a little explanation. These are not the worse games of 2014 or even the worse games that were new to me in 2014. No, it is simple a list of game where my expectations were way greater than what the experience turned out to be. These are not necessarily bad games, and heck, some people might end up enjoying them but they were sadly not for me. This might have been driven by a certain amount of hype or simply that I hyped myself after reading the rules. The games that I owned in the list ended up being traded and whomever ended up with them are quite happy. 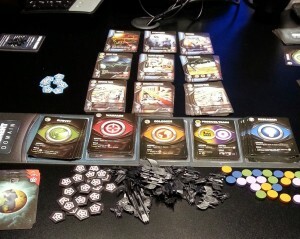 Pandemic: The Cure (Z-Man Games) by Matt Leacock: played 2 games back to back of this and ended up trading it. This is a classic case of trusting the buzz over on Twitter and on some podcasts too much. I tend to describe it as “it’s a game, it has dice”. I just don’t see the tension, the difficult decision making, the pressure. Mostly, it’s because if the dice are on your side, it’ll be super easy. Or it might be going swimmingly and then you get 2-3 bad rolls in a row and it’s all over. At least it’s quick. 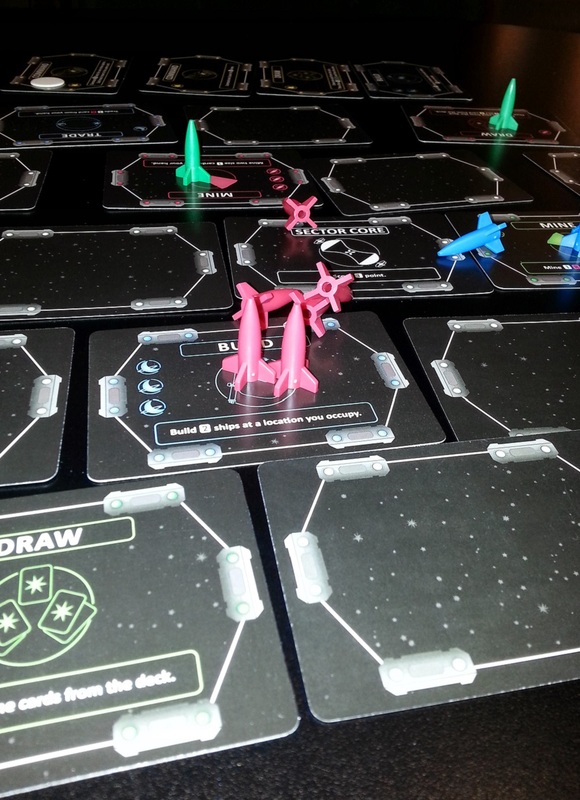 S pace Empires: 4X (GMT Games) by Jim Krohn: I really wanted to love this game. I even got the expansion before trying out the base game and the second expansion was on my P500 list. My one experience showed me two things: there can certainly be such a beast as too much detail tracking and; games where you win by destroying one other players are no fun for new players. I know you can play the game with reduced paperwork, but nonetheless for me there are just too many counters and too much bookkeeping, especially when there are other space games out there that are more streamlined. Also, while the idea of “the winner is the first player who eliminates another player” should make for an exciting game, it’s not. It mostly means that one player becomes the punching bag for the other three. Haven’t traded it yet, but expect it in The Purge soon. Six Days of War: The Arab-Israeli Conflict, 1967 (High Flying Dice Games) by Paul Rohrbaugh: Such a promising title, especially following the glowing review in the pages of the normally reliable Battles Magazine. Not only is this game supposed to cover the Arab-Israeli conflict, but also all the diplomatic positioning of both nations. Fascinating stuff, especially when you want to get an idea of exactly what is going on in the region beyond the actual conflict. 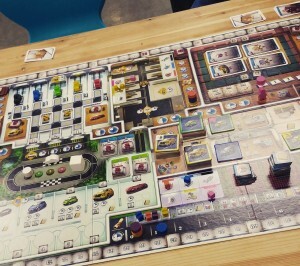 Problem is trying to play the game, with very unclear rules, a company that while responds to your rules queries, doesn’t always remember what a rule means or how to play its own game. Great idea, very poor execution. Lords of Waterdeep (Wizards of the Coast) by Peter Lee and Rodney Thompson: Another game that seems sacrilegious not to like but it was one of my worst experience of the year. I had heard a lot about it and, especially on Twitter again, the buzz was very very strong to the point that while I hadn’t purchased it, I had at least checked out the app on the iPad. My experience on the app wasn’t the strongest, but then again, there are many games that don’t translate well over on that platform so when I had a chance to try a 5 player game, I gave it a go, hoping to find out what people saw in the game and… urg. Not only was the game lacking in interesting decisions and the theme is all but nonexistent, 2 of the players had a profound case of AP. While this is not the direct fault of the game, the fact that none of the decisions are interesting didn’t help. Never again. 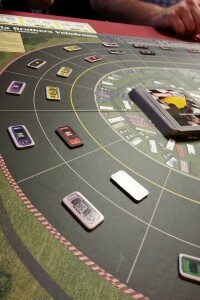 2038: Tycoons of the Asteroid Belt (TimJim Games – closed) by James Hlavaty and Thomas Lehmann: Not so much that this is a bad game, but as one of the “Grail games” of the 18XX family, let’s just say that the experience didn’t live up to the hype. 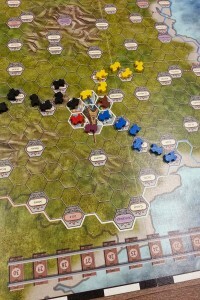 While the way it twists 18XX standards such as having to discover hexes instead of laying down tracks and having more of a pick-up-and-deliver feel, it felt unbalanced. This is apparently fixed by using the expansion set, but I’m never really a fan of having expansions fix problems with the base game. I guess I was bound to come across an 18XX I didn’t like. Island Siege (APE Games) by Dan Manfredini: Not so much a bad game than one I am really baffled by. Beautiful components (those coins! ), a very clear rulebook and gameplay that seems interesting, but my first two games left me scratching my head. Both games ended rather abruptly, with one player suddenly winning out of nowhere. Re-read the rules after to make sure we didn’t miss anything, but no. 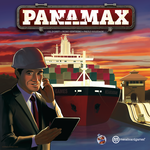 Looked at what people were saying over on BGG and the same kind of experience came up. Short and abrupt. I might have to bring it out again to see if maybe it was the way we were playing, but with so many other games, it might take a while. RAF: The Battle of Britain 1940 (Decision Games) by John H. Butterfield: Another one I had great expectation from. It comes from one of my favorite solo designer John Butterfield, he of the excellent D-Day at Omaha Beach, perhaps the best solo wargame out there. RAF is nowhere near as good, with decisions feeling more akin to gambling than based on facts and figures. Don’t get me wrong, there’s nothing wrong with a little chance in a solo design, but when it comes down to only how you want to edge your bets, then it feels like the design failed to me. The only good part of having played it is that it makes me want to get The Burning Blue to the table now. Star Realms (White Wizard Games) by Robert Dougherty and Darwin Kastle: Backed this game when it first came onto Kickstarter, figuring it was cheap enough and could be an interesting quick deckbuilder. I wasn’t impressed when I first read the rules and I left it at that, waiting for the app to come out. Ok, so I played a whole lot on the app because it was simple and fast and I figured I might eventually learn the nuances of the game. After 40+ games, I still didn’t see where the skill part came in and to me it feels a lot like Ascension (which I used to own and traded it away), with strategy seemingly boiling down to purchasing the best card during you turn. A nice distraction, but certainly not a good game. I started the year well last year with 1-2 post per week and then, in the last few months of the year I slowed down. Drastically. What happened? Work. After finishing Assassin’s Creed: Unity, I got transferred on The Mighty Quest for Epic Loot as the Lead Designer. I knew the pace of a free2play game was much faster than a regular game, but I did not expect just how much it was. Nonetheless, I really need to get back into writing more regularly. I can’t promise anything, but I’ll try to do at least 1 post a week, with at least 1 review per month. Last year some of my more popular posts were the The Mechanics series and I need to do more, including one on Stock Market mechanics and probably one on the 18XX family. Another thing that was interesting but time consuming was my brief attempt at doing video tutorials and reviews. It was a lot of fun and I want to try and do some more, especially for the longer, more complex games that don’t get enough love. Don’t expect 1 a month, but I’ll try and get 2-3 done by the end of next year. Last year I tried doing the Play 10 Games 10 Times challenge and came up short (I played less than 60 times). I still want to try and play the same games more times but committing to play a specific set of 10 games at the start of the year will not work for me since there are always awesome games coming out during the year that I haven’t played yet. So this year I’ve decided to attempt to increase my H-index to 11. Simply put, the H-Index simply states that you’ve played X games X times each. For example, my H-index is 8 right now, which means that I’ve played at least 8 different games at least 8 times each (at very least since I’ve started logging plays). My target for 2015 is to bring that number to at least 11. Considering I’ve got a bunch of games sitting at 7 plays each, I think that’s feasible. Are there any games that are particularly exciting to me early in this year? Well, there are a few, namely the scary Arkwright, which is turning out to be an excellent, if complex economic beast; Wir Sind Das Volk, a rather deep game about the rebuilding of Germany after WW2, up to the tearing down of the Berlin Wall; Brew Crafters, perhaps the best game from Dice Hate Me, along with Isle of Trains. I’m sure others will follow and catch my fancy, but if this keeps up, we should have an amazing year gaming-wise. Well, there you have it. How last year went, as far as gaming is concerned. There’s a lot of great gaming coming up in this year and I’m looking forward to making new great gaming memories. So, how has your 2014 gaming year been? Let me know! This entry was posted in General on February 3, 2015 by TopDog. Great wrap-up Steph. I found your comments on Star Realms very interesting, I’m just getting into the game, I agree with the luck part but find the game amusing and my son is also interested in the gameplay and the possibility of beating dad on a regular basis. I hope we can schedule in a game of Kanban and Viticulture next Stack. I’m not saying it’s a bad game, just one that didn’t match my expectation. It is mindless fun (as shown by the fact that I played 40+ games…), but for me, it’s just something that I don’t need to own or would not suggest. There are so many better quick little games out there.